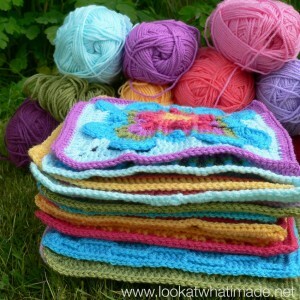 There are so many methods for joining crochet squares. This one is my favourite, though, both for how it looks and for how flat the resulting seams are. Let me tell you a little secret. I had used this method years ago when I just started crocheting again and had not liked the fact that it took a bit longer than some of the other methods (I know! Lazy!!). I was therefore very reluctant to give it another go. Beth, one of my testers and a very good friend, urged me to try it again. She was adamant that I would love it. And she was right! The zipper method does take a bit longer than the other methods out there, but give it a try and see how you like the finished result! I am calling it the “zipper” method, because that is what Beth called it. And she is right again. You crochet the blocks together as if you are zipping them up. I have made the join with a contrasting colour to better illustrate how it works, but you can use the same colour as your squares and the seams will blend in effortlessly. In the pictures above you can see that the slip stitches form a flat cable on the front of the blanket and a running stitch on the back. Please Note: To join the squares using the zipper method, you will place the squares side by side, instead of on top of each other. When you place the squares side by side like this, the v’s formed by the stitches of the last row/round of each square will be parallel to each other. The 2 front loops will be farthest away from each other (so on the outside of the join). The 2 back loops will be right next to each other, so on the inside of the join. For the purposes of this tutorial I will call them the inside loops (see adjacent photo). You will be working ONLY into the inside loops (back loops). First you will need some squares. I am using my Iced Pie Squares for this tutorial. Next you will need to place your squares side by side with the right side of both facing up (Photo 2). Starting with the block to your left , insert your hook from front to back into the inside loop of the first stitch. Now insert your hook from front to back into the inside loop of the first stitch of the other square (Photo 3). If you are going to be adding new yarn to join your crochet squares, add it now by placing a slip knot on your hook as in Photo 4. I like starting with a slip knot. If you don’t like starting with a slip knot, simply yarn over with your new colour. 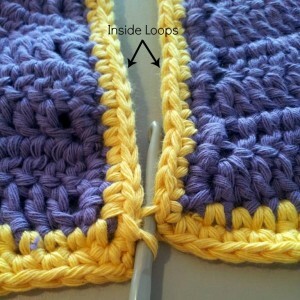 Pull through both of the stitches (loops) on your hook (Photo 5). Remember to keep your tension loose. Slip stitches are not as elastic as other stitches, so if you work very tightly, your edges won’t have any “give”. Keep working a slip stitch into the inside loops of each stitch (through both layers) this until you have joined all the stitches down the side of your squares. When you get to the end, bind off. Photo 9 below shows a different view of what it should look like when you have inserted your hook through both of the inside loops from front to back. Inserting your hook in this way will cause the two inside loops to lie on top of each other instead of side by side. This is what makes the seam so flat. Photo 10 illustrates the seam from the front. Photo 11 illustrates the seam from the back. You can join these squares in a grid like Lucy from Attic24 does in her tutorial, but because you are working with the squares side by side and the yarn in the back, it becomes a bit fiddly. If you want to try this method, don’t bind off when you have finished joining the first two squares. Lay the next two squares next to each other as before and continue slip stitching them together as instructed above. You can attach any number of squares in this fashion. The idea is that you join all the squares in one direction first and then join all the squares in the other direction. To join the “unjoined” sides, turn the joined squares 90 degrees and repeat the whole process. The easier method by far is to join the crochet squares to each other in long strips, as if you were making a bunch of scarves. You can then join these strips to each other using the method above. When I make my squares I leave a 1 meter/1 yard tail of yarn when I bind off. I use this tail to attach the crochet squares to each other as I make them. If I left all the joining until the end, I would probably never complete a blanket. 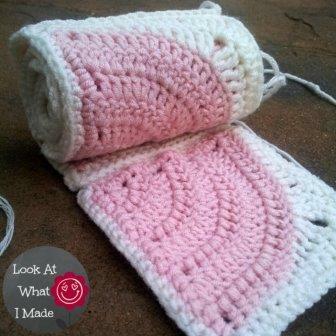 If you find this “zipper” method too fiddly, have a look at this post from Knot Your Nanas Crochet. 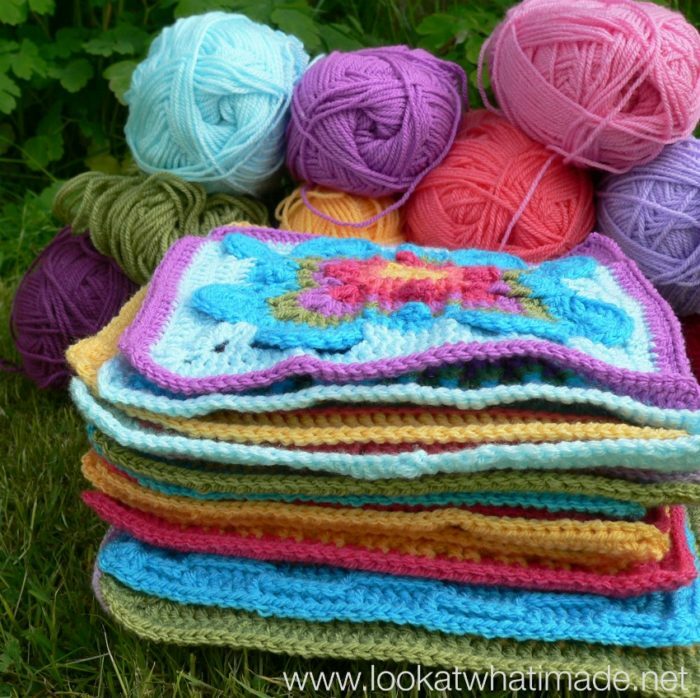 It is a round-up of 10 tutorials for joining granny squares. Of the ten, Lucy’s method (link above) is my favourite. It is both easy and very well explained. I hope you have found this tutorial useful. If you have any questions or feedback, shoot me a comment! I’m guessing that you stumbled upon this post because you like making squares. 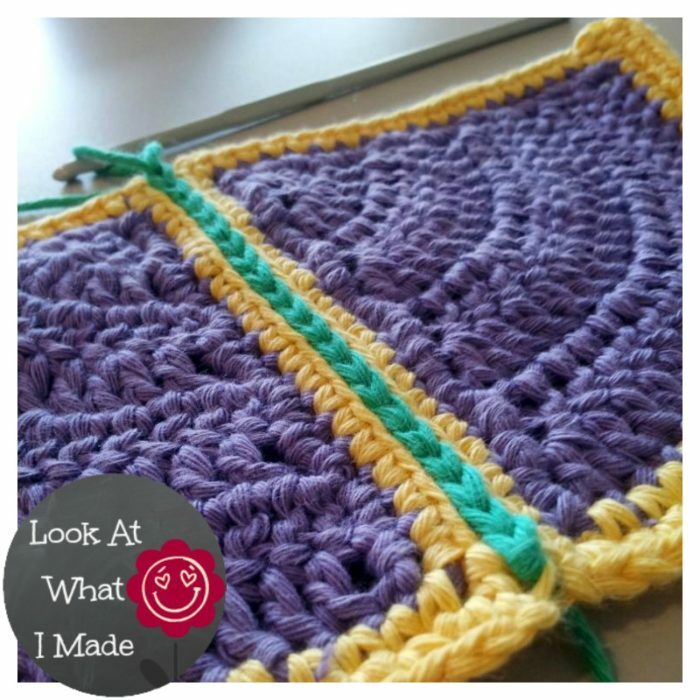 If I’m right, you might enjoy joining in the Block a Week CAL (Crochet-along) being hosted by Kimberly Slifer from the Official CCC Social Group on Facebook. We are making 45 weekly squares over the course of the year. At the end of the year we will be blocking and joining them so that we end up with a lovely blanket in time for Christmas. I will be doing a photo tutorial (with permission from the designers) for each block (apart from the first 4), so even if you are a beginner, you should be able to follow along. Interested? You can read more about it (and find the links to date) here. I can’t wait to try this, will it work on other motif shapes? I started making African Flowers (Hexagons) but didn’t think ahead of how to join them, now I have 25 of them and if this works I’ll finally have a way to make them into a blanket. Help. My afghan squars keep coming apart with use. I attached them with a slip stitch because I knew if no other method. I’m at a loss as to why this would be happening. The only thing I can think of is that the yarn you used is disintegrating? This has never happened to me, so I am not sure how to help you. Thanks! I needed a flat method to join squares. I’m eager to try this type of finish on the Afghan I’ve made. My blanket is 10 blocks x 8 blocks. Should I do the horizontal first or the vertical first? I’d like the overall look to emphasize the vertical(10 blocks). Thanks! Erica, I do the vertical joins first and then join the strips horizontally. Can I use the zipper join if my squares have different stitch counts? They are blocked to the same size, but not all have the same count. Hi Ann. Yes, you can. You will just need to fudge it a bit. I have done this in the past by working into every st of the larger square (the one with more stitches) and sometimes working into the same st of the other square twice. For instance, if I have 3 sts more on one square than on the other, I would work into the same st twice THEE times along the side of the square that has fewer sts, spacing these ‘increases’ evenly. Thank you so much! I had to seam the shoulders of a hoodie for my daughter, and did not want a big annoying seam to bother her and rub against her, but I cannot do mattress stitch to save my life. I don’t know why. This worked perfectly. Hi Gloria. I love the (sc, ch 1, skip 1) join my granny taught me. You can find that HERE. Is it best to block the squares before joining? I’m making a blanket with 4 large panels and I used Tunisian crochet, which made the ends curl quite a bit. I always block before joining so that I am sure the joins won’t be too tight. But you don’t HAVE to. If you don’t like to block first, just make sure your joins are ok by checking for stretch periodically. I’ve never seen this “Zipper Method” before. It’s brilliant and has a really clean crisp look. Thank you for sharing. Now I’m going to check out what other great ideas you have! You’re welcome. It takes a bit of time, but I think it is well worth it if that is the look you desire. If I want a much quicker method, I use the (sc, ch 1, skip 1) method. How do you treat the corners when they are a chain 2? Do you skip them or put a stictch in them? One of the chains belongs to one side of the square and the other one belongs to the other side. When joining, you will make a sl st in the first chain of the ch-2 corner. When joining the next 2 squares, you will make a sl st in the second chain of ch-2 corner from the next square. When you go to join in the perpendicular direction, you will sl st in the remaining ch’s of each corner. I hope that makes sense.